From the occasional eyelash that wanders uninvited into your eye to the high-speed missile impact from an ejected metal shard, you may find yourself with something in your eye (medically referred to as a foreign body). 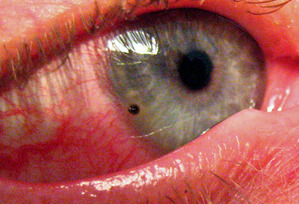 Depending on what it is and how the injury happened, the foreign body may pierce the eye and cause serious injury. 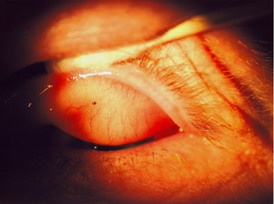 Most people realize that an eyelash in the eye does not require an evaluation by a doctor but that a metal shard in your eye would warrant a visit to your eye doctor to remove the foreign body immediately. Treatment: Removing the foreign body and ointment/patching the eye as needed. Ruptured eye will require surgery. Prognosis: This depends on the severity and location of the injury. Most are good when superficial. Seek immediate professional help when occur. Prevention: Wear safety goggles with side shields when working in a dusty, flying debris environment.